Everything in your vehicle is inspected to ensure it is safe and operating at its optimal level. We start inside the car, checking to make sure your interior lights (cabin and dash) are lighting up and that your exterior lights, including turn signals, brake lights and hazard lights are working. We also take the time to test the windshield spray pattern to make sure your windshield is being covered properly and that your wipers are effectively clearing your field of vision. The horn and parking brake are also tested before we move on to the next stage. Following the interior inspection, we check the battery for its performance and make note of the date of manufacture. No matter how efficiently your car runs and how cautious you are about turning everything off before leaving your vehicle, batteries do wear down overtime. Knowing how old it is can help us ensure that yours is replaced before you have any trouble. We then pop open the hood and start checking out the engine and its components. Oil, power steering, brake, transmission, coolant, and windshield washer fluids are checked for levels and condition. These fluids are vital for the proper functioning of your engine and other components and can be the first indicators of trouble. We inspect the hose and clamp connections for leaks, tightness and signs of corrosion and check out the condition of the cabin and engine air filters. The drive belt is also examined for signs of splitting or cracking and plays (how much the belt moves up and down). This is especially important as a belt failure can cause serious engine damage. Once our techs have finished the engine inspection, we lift the vehicle to take a look underneath. Raising the vehicle up gives us the opportunity to look at your steering and suspension components. We remove the wheels and check for tire wear and proper inflation and, after removing the wheels, we inspect the condition of your brake components, including wear on rotors or drums, pad and hose condition and connections. This also lets us take a look at your suspension struts and coils to ensure everything is in order there. While the car is on the life, we have access to your exhaust system which is checked for rust, rattles, and attachment from front to back. You oil plan is also given a once-over to make note of any leaks or problems. Your Honda is not much use to you if you can’t steer it, which is why ball joints, bearings, tie rods and axles are all inspected for proper lubrication, tightness, and play and your steering fluid level is checked earlier in the inspection. The multi-point inspection is performed by a certified Honda mechanic every time you bring your vehicle in for servicing. If we notice anything unusual or that we think might need further during the inspection we’ll check it out further and bring it to your attention before performing any work. Bringing it in for servicing at the dealer also means we’ll have any of the Genuine OEM parts available in the event a repair is needed. It’s also a good idea to know how your vehicle sounds and feels when it is running normally, so that you can recognize when something doesn’t seem right. When that happens, bring the vehicle in, let us know what’s going on, and we’ll focus extra attention on what the cause could be during our inspection! No one knows your Honda better than the service team at Henley Honda, so don’t let a stranger under your hood. 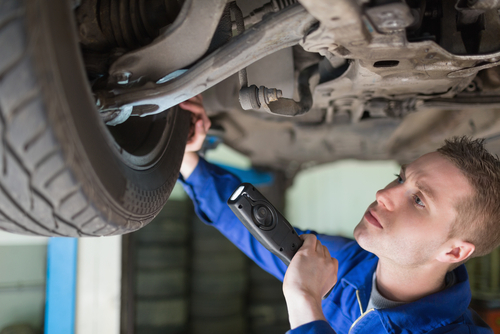 Bring your vehicle in for regular maintenance and receive the multi-point inspection every time!